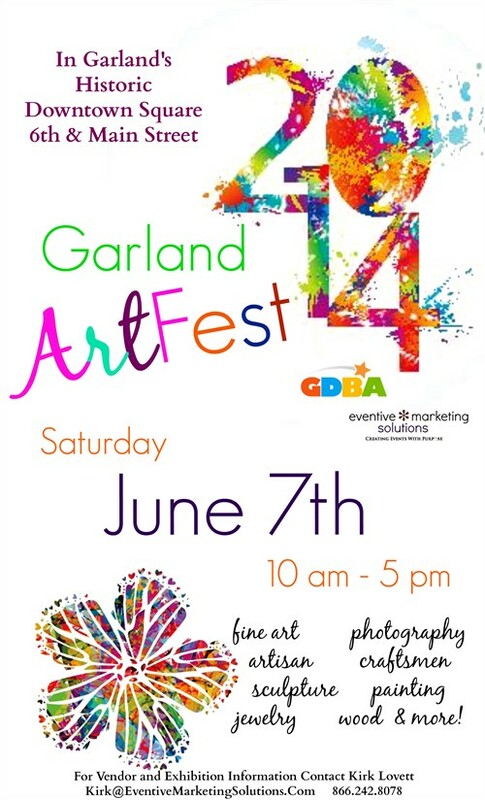 As far as we know, the very first Art Fest to take place in the City of Garland occurred on Saturday, June 7. First time events do not normally attract the number of vendors or crowds that established events draw, and this was no exception to the rule. The vendors and artists we spoke to at the end of the day were pleased with the number of sales they made and said they would be back. They will spread the word and the next Art Fest will have greater participation. It will be up to the organizers to do a better job of promoting the event in a way that will appeal to those multitudes of souls who enjoy strolling amid outdoor festivals. We first visited with the vendors and artists positioned around the downtown square at street level. Then wandered down into the lower level where the vendors were positioned around a large black hole with pond scum at its bottom. From that vantage point, our first ever Art Fest looked as though it could have been taking place in a third world country. That is surely no way to attract visitors to, or build businesses in Historic Downtown Garland. Someone representing the COG should apologize to the organizers and participants of this event for not doing their share to support it. It is our understanding that the downtown square will be redesigned and reconstructed in a couple of years. Until then, could we please keep the heart of downtown more presentable? Why not fill in that unsightly black hole with dirt and create a beautiful garden? The City has the manpower, facilities and talent on staff to create a little showplace. This is an opportunity for our Parks and Recreation Department to show what they can do. Let’s hope the COG will spare us the embarrassment of another event on an unsightly, unkempt venue site.